“I am a Jew, from Tarsus of Cilicia, a citizen of no mean city” (Acts 21:39). 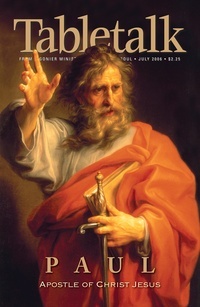 Saint Paul the apostle is the subject of the July 2006 issue of Tabletalk. The reason is as simple as can be: our love for the man God chose to preach His Gospel to the nations. Studying him and his works is arguably the most rewarding endeavor one may undertake. Seeing his dynamic personality — his warmth, his intensity, his devotion, his grace-full preaching — is what leads us to share with Tabletalk’s readers the multi-faceted character of the Apostle to the Gentiles. Contributors include R.C. Sproul along with Jerry Bridges, John Nunes, Thomas R. Schreiner, R.C. Sproul Jr., Gene Edward Veith, and Cornelis P. Venema. Tabletalk features articles about topics central to the Christian faith and daily, in-depth Bible studies.